An inquest on Nottingham Forest owner Nigel Doughty has been opened and adjourned. Mr Doughty, 54, was found dead in the gym at his home in Skillington, Lincolnshire. The inquest at Lincoln Cathedral Centre heard that post-mortem tests carried out on the life-long Forest fan had so far proved inconclusive. The court heard he was found by his family "collapsed and lifeless" at 13:15 GMT. Mr Doughty, who was described as fit and well by his family, bought the club in 1999 for £11m, saving them from administration, and took over as chairman from Eric Barnes three years later. 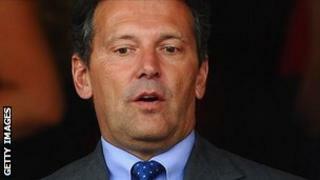 He is estimated to have invested more than £100m of his personal fortune into the club. However, in October, he announced he would be stepping down from his post as chairman at the end of the season.